Authority of PHED through a competitive examination. Vacancies are available in Mission Directorate of Swachha Bharat Mission which Technical Officers to be placed. 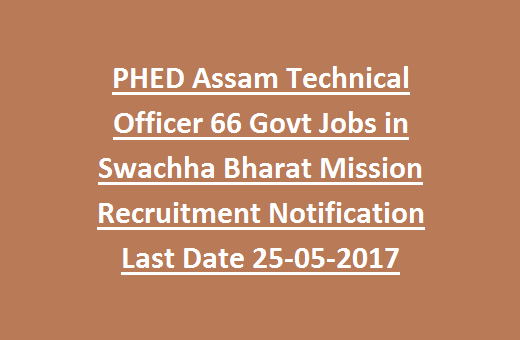 There are total 66 vacancies available in this Assam PHED Technical Officers Jobs recruitment 2017. Eligible candidates download the application from PHED web portal @ www.aphe.gov.in. The selection for ASSAM PHE Officers vacancies are going to be filled up through written test/ Interview conducted by Assam State Disaster Management Authority. For more application process details, Essential Qualification, Selection Process of Assam State Swachha Bharat Mission PHED are given below. Click here to see the official notice of Assam PHE Technical Officer Jobs Recruitment. Last date for the receipt of Application form: 25-05-2017. 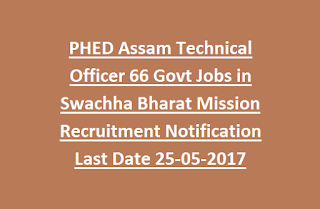 Post Name: Technical Officer (Swachha Bharat Mission): 66 posts. Place of posting: Guwahati, Assam. Must have qualified Degree/Diploma in Civil Engineering from a recognized university. For B.Tech/B.E candidates Minimum one year experience and for Diploma candidates 2 years work experience is required. Must have computer knowledge in MS Office. Candidate age limit should not be less than 18 years and above 35 years as on 01/01/2017. For Age relaxation details see the official notification. Candidates applying for PHE Assam Jobs will be selected based on Written Test/ Interview. Selection will be in district level only. Particular district candidates selection will be based number of applications received. Interested candidates may go through the Assam PHED official website @www.aphe.gov.in to download the application. Along with application must send the CV or Resume and other required documents. Fill the application form with all required columns and send along with mentioned documents to the given address. Last date to send filled application form is on or before 25-May-2017. Click here to download application and Notification for the Assam Technical Officer Jobs Recruitment 2017.